Shockingly gruesome violence has defined South Sudan since civil war broke out in 2013, only two years after it gained independence. Over 50,000 people have been killed since, including tens of thousands of civilians. Over 4 million have been displaced. The United Nations peacekeeping mission in South Sudan (UNMISS) was established in 2011 to foster development but has faced broader responsibilities. The evolution of UNMISS’ role presents an opportunity to understand the changing demands and challenges facing peacekeepers today. UNMISS grapples constantly with the difficulty of operationalizing its mandate to protect civilians—especially women. Its presence has been controversial but has brought the needs of and the need for women to the forefront of peacekeeping efforts. Women and girls are disproportionately affected by violent conflict, and this civil war is no exception. One in four women in South Sudan experience some form of gender-based violence on a daily basis. Thousands of women have been raped by government and opposition forces. 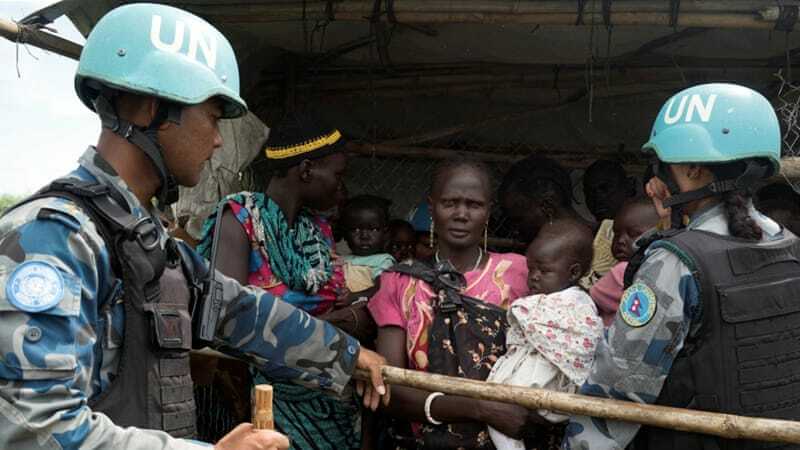 Though women only represent three percent of soldiers and ten percent of police deployed to UN missions worldwide, the numbers are slightly higher in South Sudan. As of August 2017, four percent of UNMISS’ military forces—14 percent of police personnel and 26 percent of civilian personnel—were women. From inception to 2014, the mission was led by a woman, Hilde Johnson. Two women have been contingent commanders: Adzo Sowlitse, the first woman to command a Formed Police Unit, and Lt Col Katie Hislop, Commander of the UK Engineering Task Force. UNMISS has grown to include 16,987 troops but still cannot seem to control the chaotic growth of PoC camps. Over 200,000 internally displaced civilians are sheltering in UN bases turned into “Protection of Civilian” (PoC) sites. The mission’s quick growth has perhaps outstripped its capabilities, exacerbating anti-UN sentiment among civilians, and the strained relationship with government. Although arguably innovative, the PoC sites cannot guarantee residents’ safety. Four PoC sites have been overrun or shelled, over 180 internally displaced persons have been killed during attacks on the sites, and hundreds of women have been raped on or near UN-protected territory. Doctors Without Borders found that three-quarters of those surveyed living in PoC sites had lost trust in UNMISS. Safety in PoC sites has been unreliable, and site management has demanded a majority of mission resources. This has prolonged the time women spend surviving—and raising families—in tents, in such persistent states of vulnerability. Notably though, UNMISS was the first UN mission to deploy Women’s Protection Advisors across the country. UNMISS former gender adviser Major Bettina Stelzer emphasised women peacekeepers are able to access communities in ways men cannot. To capitalise on this, UN police train women leaders in community watch groups to gather sensitive information about sexual abuse in the camps. Along with serving as mentors and role models, it is critical to understand how women peacekeepers can provide necessary support and open up channels of communication that could inform UNMISS activities. There remains a deficient connection between UNMISS and the community. This was placed in stark relief during an attack in July 2016. Over 300 people were killed in the capital city, Juba, with foreigners and locals assaulted alike. The UN compound, less than a mile away, refused to respond. Peacekeepers abandoned posts, according to the UN’s fact-finding mission. Retired Major General Patrick Cammaert, who led the investigation, concluded that troops were risk-averse and inward-looking—regularly staying in camp rather than going out on foot patrols. Another incident exemplifying deficiencies of response and diffusion of accountability came in February 2018, when 46 UNMISS peacekeepers were recalled following allegations of sexual exploitation of sheltering women. Without prosecutory mechanisms, the UN cannot effectively prevent or punish misconduct. Complaints of sexual assault by government soldiers in or near camps are also common. Growing resentment among residents towards the UN mission is evidence of slow and inefficient action by authorities. A small, wooden “jail” has been established in a PoC in Malakal to hold alleged rapists awaiting investigations that may never occur. Even without systematic reforms to the Department of Peacekeeping, creative efforts to make environments safer could mitigate threats. These should include the reduction of masculine military tactics and the expansion of desecuritised peacekeeping—strategies like digging nearby wells to prevent unguarded walks to distant water or developing 911 numbers for civilians and providing cell phones. These must also include purposeful recruitment of women into peacemaking, -keeping, and -building efforts. In terms of policy, UN Security Council Resolution 1325 calls for more women involved in peace agreements and peacekeeping operations. However, according to a 2015 review, fewer than three percent of signatories to peace agreements are women, and women are frequently kept out of high-level negotiations. Judging from the consistently low levels of participating women, the UN has not taken seriously recommendations to incentivise the appointment of more female troops. Embedded in these simple suggestions is a danger of further burdening women by essentialising them as inherently peaceful. Such justification for women’s participation is laden with specific expectations rather than based in their fundamental right to participate. Evidence shows that security efforts are more successful when women are included in peace processes. Involvement of women’s organisations makes peace agreements 64 percent less likely to fail. Peace agreements on the African continent which failed to maintain peace for even a single year—in Uganda, Sierra Leone, Somalia, and Sudan—all had in common a complete lack of women at the negotiating table. The UN should focus on protection strategies for women made vulnerable in PoC sites. PoC sites are, as evidenced by the number of IDPs who continue to voluntarily reside within them, an important, if imperfect, tool. Along with strengthening practical protections for civilians, UNMISS should continuously increase involvement of female troops, whose nuanced perspectives are a necessary part of peacekeeping. Their unique access will allow for the equally necessary elevation of the experiences of local women, whose participation, safety, and empowerment are critical to the sustainability of peace. This seems very unlikely. Do hostiles really attack women and girls, while leaving men and boys alone?